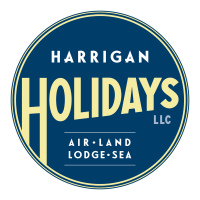 We can work with you on your own itinerary for self-drive/chauffeur driven vacations, your own private group (10 or more people), or help you choose the best escorted tour for you. 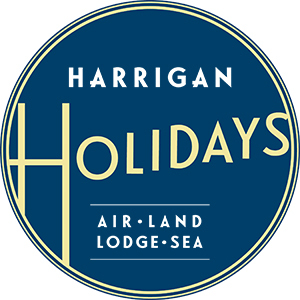 Harrigan Holidays offers three exclusive guaranteed departure coach tours in Ireland. All three include 3* & 4* hotels, transfer to/from airport, coach driver/guide, breakfast daily, some dinners dinners and admissions as noted in itinerary. Flavour of Ireland - On this 7 day tour you will visit the Ring of Kerry, Cliffs of Moher, Blarney Castle, Blarney Woollen Mills, visit Galway City, take a Jaunting Car ride in Kerry and a ferry ride across the River Shannon. In addition, and you will learn some Irish history thanks to your English Speaking guide. One dinner is included and you have the option to add a Medieval Banquet at Bunratty Castle. All this starting at $979 per person sharing land only. Tour runs Monday thru Sunday. Click here for dates, rates and full itinerary. Unforgettable Ireland - On this 8 day tour you will visit Ring of Kerry, Cliffs of Moher, Blarney Castle, Blarney Woollen Mills, Galway Cathedral, Connemara National Park, Kylemore Abbey, Trinity College, the Burren, and Clonmacnoise. You will learn some Irish history thanks to your English Speaking guide. You will also take a ferry ride across the river Shannon, a Cruise on Lough Corrib - including scones & an Irish coffee, and a tour of Dublin. Two dinners are included and you have the option to add a Medieval Banquet at Bunratty Castle and/or an evening of entertainment at Taylor's Three Rock or similar in Dublin. Prices start at $1239 per person sharing land only. Tour runs Monday thru Tuesday. Click here for dates, rates and full itinerary. Explore Ireland - On this 13 day tour you will take in some sights in the whole of Ireland with visits to the Ring of Kerry, Cliffs of Moher, Blarney Castle, Blarney Woollen Mills, Galway Cathedral, Connemara National Park, Kylemore Abbey, Trinity College, The Burren, Carrowmore Cemetery, Belleek Pottery, Giant's Causeway, Belfast Titanic Experience, Mount Castletown House and Christchurch Cathedral and you will learn some Irish history thanks to your English Speaking guide. You will also take a ferry ride across the river Shannon and from Portaferry to Strangford Lough, a Cruise on Lough Corrib - including scones & an Irish coffee, and a tour of Dublin, Derry, and Belfast. Three dinners are included and you have the option to add a Medieval Banquet at Bunratty Castle, and/or an evening of entertainment at Taylor's Three Rock or similar in Dublin. Prices start at $2259 per person sharing land only. We had a great trip and great weather - no rain! Arrived in Dublin early. There were ten people on the tour for the first three days - four Canadians (one couple, plus one woman and her mother), a family of four from Denmark (husband wife, and two adult daughters), plus us. The Danes left us Saturday morning in Limerick to continue with the shorter tour, so there were just six of us for the rest of the time. The size of the group was nice because the bus was smaller and could stop for photo ops at places a larger bus could not stop. It also made for a more intimate group - we all ate together every evening.